Encryption of backup data is an important precautionary measure to avert any information leakage. Encryption enciphers the file with a special code, and bounds it with the encrypting appliance. 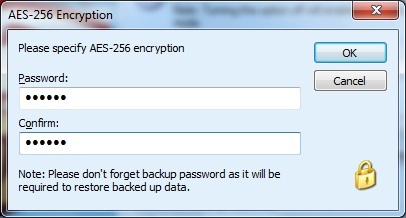 Leo Backup uses AES-256 algorithm which is the industrial standard for data encryption. This appliance is built in Leo Backup, so when you locked your backup set, it will require two things to decrypt it - the password and Leo Backup itself.